Update your look in an instant with this Tommy Hilfiger strap watch. Taken from his popular collection, the modern dial with dazzling crystals partners well with the matching pink strap - so stylish, you'll want to wear it anywhere and everywhere. 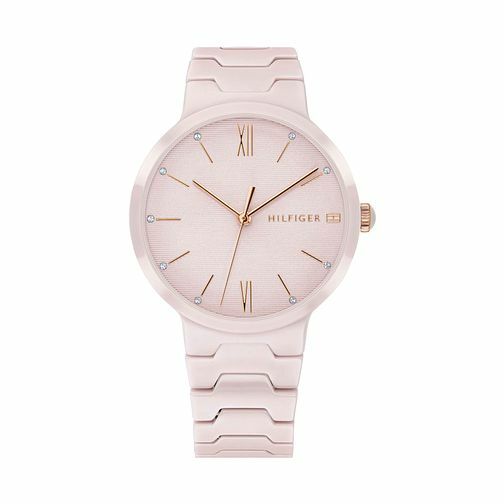 Tommy Hilfiger Pink Ceramic Bracelet Watch is rated 5.0 out of 5 by 1. Rated 5 out of 5 by Anonymous from Stunning Watch. Looks better than the photos Absolutly love this watch. Looks so much better in store. I would highly recommend. Especially with the Rose gold on the watch dial.